Morning tea is an honoured tradition in the organisation where I work. It is a gastronomic institution that occurs every pay day Thursday and the stakes are high. There is an honourable mention made by the director at every morning tea where he highlights the plate of the day. 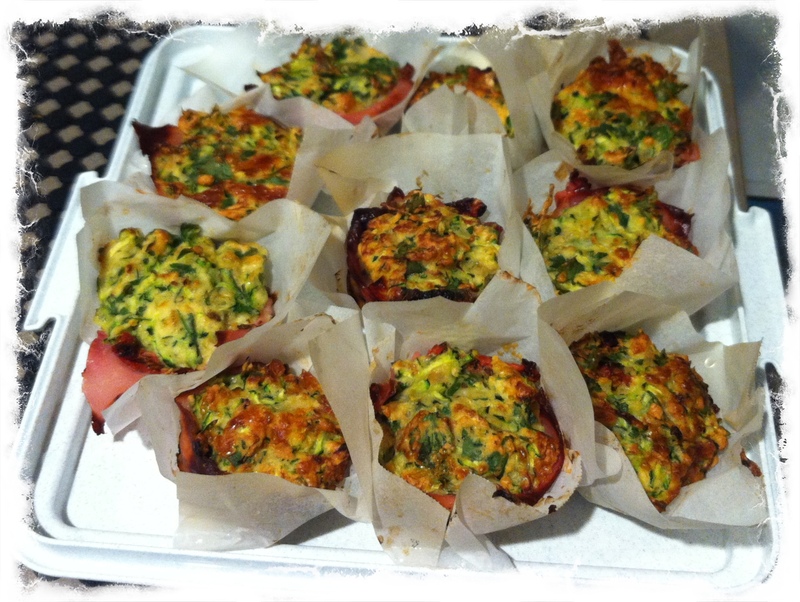 I decided these ham and zucchini snacks were just the thing I needed to produce if I was to have a chance at getting that honourable mention for myself. I do love Better Homes and Gardens magazine where this recipe came from back in 2011. These cheesy snacks are easy to cook and easy to eat. They have a great savoury muffin flavour but come with an added bonus – a strategically hidden vegetable (in this case zucchini). I work with a lot of men and they love ‘yellow food’ (any thing in pastry that contains MEAT, MEAT, MEAT, MEAT- such as sausage rolls, meat pies or fried protein of any description) dipped in red sauce. These ham and zucchini snacks were yellow in colour, contained meat (ham) but were healthier for them than a fried morsel. I have to admit I advertised them as cheese and ham snacks (deception is not bad if it comes from a place of good intention – my story and I’m sticking to it). The reaction was silence – that good silence you get when people are enjoying your food and don’t have time to talk – must eat! They were a hit and I shared the honourable mention with Doug who made these amazing meatballs with home made sweet chilli sauce. You can freeze these for up to two months, then reheat for 15-20 minutes. For a vegetarian option, substitute the ham with a generous handful of sun-dried tomatoes. Preheat oven to 200oC/400 oF/gas 6. Grease a 12-hole medium muffin tin with cooking oil spray and line holes with squares of baking paper. Wrap zucchini in a clean, thin, woven kitchen cloth or muslin. Squeeze to remove excess liquid. Put zucchini in a large bowl and set aside. Heat olive oil in a large frying pan over a medium heat. Add onion and garlic and cook for 3 minutes, then transfer to bowl with zucchini. Add cheese, flour, parsley and egg and stir until well combined. Season with salt and pepper. Evenly divide ½ the mixture between prepared holes, then top with ham and remaining zucchini mixture. Transfer to oven and bake for 25 minutes or until puffed and golden. Transfer to a wire rack to cool slightly. Serve. Complexity Rating: – Basically child’s play.